Painted before his shift into bright colours, this painting is reminiscent of the time Van Gogh worked with earthly hues and sombre tones. The later shift would go to define his work as an artist. With reverence to Holland’s most distinguished artist, we take great pride in producing exact replicas of his work. All of our painters are expertly trained in his style, with deep knowledge in all of his techniques such as impasto, colour mixing, rhythm of application, and brush strokes. During his stay in Nuenen and Antwerp, Van Gogh produced paintings and drawings with muted colours. He took great care to study peasants and their daily way of life, so that he could reproduce their images on canvas. Therefore, his paintings mostly consisted of dark earthy colours and muted palettes. After he moved to Antwerp, he began studying colour theory, particularly the work of Peter Paul Rubens. This broadened his usage of colours from the usual browns to include a variety of other colours, such as carmine, cobalt blue, and emerald green. This helped him produce later pieces such as the Sunflower series, which he became so famous for. 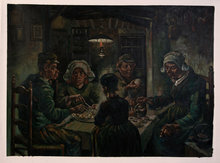 During his stay in Antwerp, Van Gogh was struggling to feed himself, since he spent most of the money that his brother sent him for painting materials. In order to gain some extra money, he offered to paint portraits for anyone willing to sit for them. 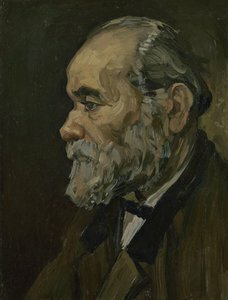 The portrait of an old man with beard was described as a “wonderful old man”. Although his identity is not known, this was one of the works that Van Gogh created so that he could earn some extra money for food. This painting is one the last works where Van Gogh kept his muted style before he adopted something a more colourful.